Beyond the acronym, it's hard to figure out what WAZA (the World Association of Zoos and Aquariums) actually stands for. If you look at WAZA's Code of Ethics and Animal Welfare you may think the organisation's overarching aim is to ensure animals kept in zoos and aquariums are well looked after. In public, WAZA insists that all of its member facilities are committed to a stringent set of welfare standards. What it doesn't publicise is how often and how explicitly this Code of Ethics and Animal Welfare is breached by those members. And that breaches almost always go without WAZA's reprimand. 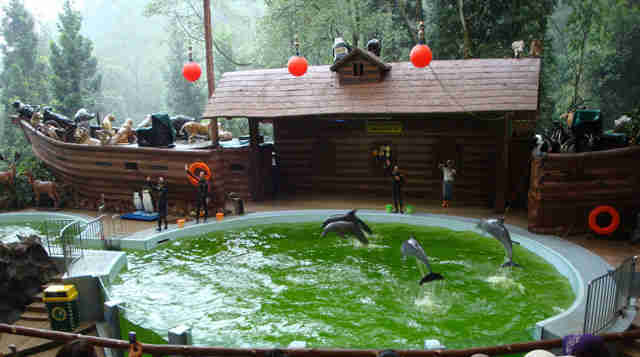 As an organisation that brands itself as the voice of the world's leading zoos, WAZA's failure to regulate conditions at its member facilities is shameful. "Any actions taken in relation to an individual animal, e.g. euthanasia or contraception, must be undertaken with this higher ideal of species survival in mind, but the welfare of the individual animal should not be compromised." Because "surplus" animals take up space and budget allocations, the welfare of individual animals is clearly not taken into account by WAZA zoos. 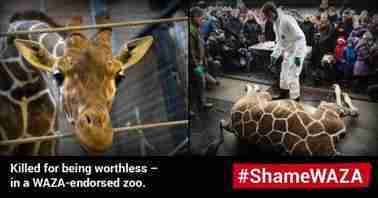 Two high-profile cases include Copenhagen Zoo's decision to kill and dissect one such "surplus" giraffe in 2014, and Magdeburg Zoo's unlawful killing of three Siberian tiger cubs in 2008. In both instances, the animals were perfectly healthy. Their "welfare" was best served by the continuation of their lives. Any threat the zoos claimed they might have posed to the genetic diversity of its breeding pools could have been easily remedied using sterilisation or transfer. And yet, in both cases, WAZA defended the actions of its zoos - even going so far as to condemn the German court which found Magdeburg Zoo staff guilty of animal rights violations. "Any legislated codes for animal welfare should be regarded as minimum standards." If even the most basic of WAZA's code of ethics go unenforced, no wonder its members aren't taking it seriously. Indeed, as the list goes on, the distance between words and reality yawns even wider. "All exhibits must be of such size and volume as to allow the animal to express its natural behaviours. Enclosures must contain sufficient material to allow behavioural enrichment and allow the animal to express natural behaviours." In spite of these stipulations, there are numerous WAZA zoos around the world keeping animals in substandard and even cruel environments. Take, for example, the tiny, filthy bear enclosure at Almaty Zoo in Kazakhstan; the dirty, green dolphin pool at Taman Safari in Indonesia; and the muddy orangutan enclosures at Zoo Negara in Malaysia, which has sent tourists home in tears and been condemned by a local MP for the malnourished appearance of its animals. (c) not demean or trivialise the animal in any way." One could be forgiven for questioning what educational message dolphins putting on an elaborately staged and choreographed show at Georgia Aquarium is communicating. Or what type of 'natural behaviour' elephants playing basketball under threat from men with bullhooks at African Lion Safari in Canada is replicating. Furthermore, WAZA's code of ethics opposes: " collecting for, or stocking of animal exhibits, in particular aquariums, with the expectation of high mortality." However, when Taiwan Aquarium imported six wild-caught belugas and half of them died, then imported another four that all died, it was the Taiwanese government that stepped in to prevent them importing more, not WAZA. "cruel and non-selective methods of taking animals from the wild". Despite this, there is evidence that certain WAZA institutional members purchase dolphins from the particularly horrific, and globally condemned Taiji drive hunts. 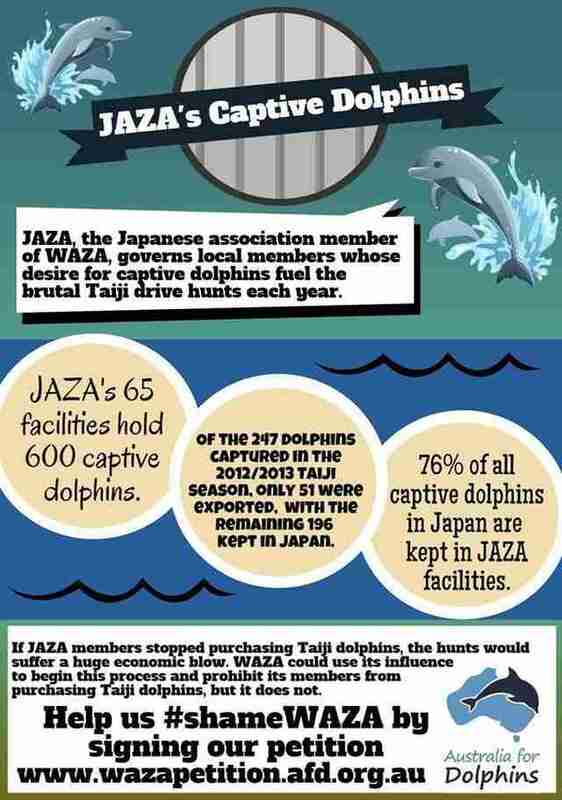 As for association members, 55% of aquariums in JAZA (WAZA's association member in Japan) purchase Taiji dolphins for entertainment shows. Despite all of WAZA's appealing words and impressive sounding code of ethics, there is little to back up either. WAZA claims that all of its members must adhere to the set of standards that have been outlined and dissected above. But it does nothing to ensure that even the most basic welfare standards are met. Which is just not good enough – especially because WAZA receives public donations and enjoys tax-exempt status. It is distressing for those who visit these zoos and aquariums - believing them to be of a high, international standard because of their WAZA membership - to find animals being grossly neglected and mistreated. A code of ethics means nothing, unless WAZA is willing to enforce it. 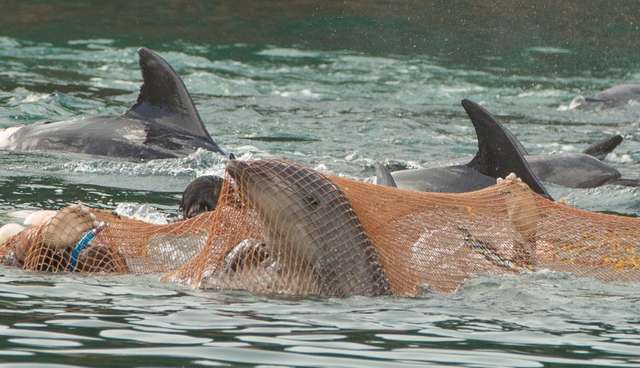 The aim of Australia for Dolphins is to stop cruelty to, and gain legal protection for, dolphins and other small whales. AFD's primary goal is to bring an end to unregulated and inhumane hunts which kill tens of thousands of small cetaceans annually. Initially, AFD will focus on the world's largest hunts - the dolphin, porpoise and pilot whale hunts which occur in the waters off Japan. While AFD is based in Australia, dolphins and whales need our help in many countries and, as such, our efforts to protect them are truly global.